The trend is clear. More and more Americans are being pushed into high-deductible health plans (HDHPs), which have an annual deductible of $1,300 or more for self-only coverage and $2,600 or more for a family, according to the National Center for Health Statistics (NCFHS). The same NCFHS survey revealed that in the first six months of 2017, 42.9 percent of persons under age 65 with private health insurance were enrolled in an HDHP, up from 25.3 percent in 2010 and 39.6 percent in 2016. What does this mean for health practices? It means that more and more of patients are being asked to pay for the costs of their office visits. Per a BlackBook™ 2017 Revenue Cycle Management Survey, patient healthcare costs—including both deductibles and out-of-pocket maximum payments—have increased by 29.4 percent since 2015, making the average deductible $1,820 and average out-of-pocket expenditure $4,400. In turn, that means the burden is increasingly falling on the practice to collect those payments. Of course, health practitioners are not alone. The BlackBook survey also revealed that 83 percent of physician practices with fewer than five practitioners identified the slow payment of high-deductible plan patients as their top collection challenge. Communicating payment accountability to patients rated a close second at 81 percent. The good news is that “improvement was noted among the physician practice respondents that utilize electronic payment alternatives.” Those practices that accept credit and debit cards benefit both the practice and the patient experience. In fact, this was highlighted in this blog in June 2017, in the Top 10 Benefits of Accepting Credit Cards for Medical Practices. Among the long list of benefits is the fact many patients prefer to pay with a credit or debit card, making them more likely to settle up at the time of service. Also, accepting credit cards allows a practice to set up automatic payment plans secured by the patient’s credit card, thereby ensuring prompt payment and regular, predictable cash flow. 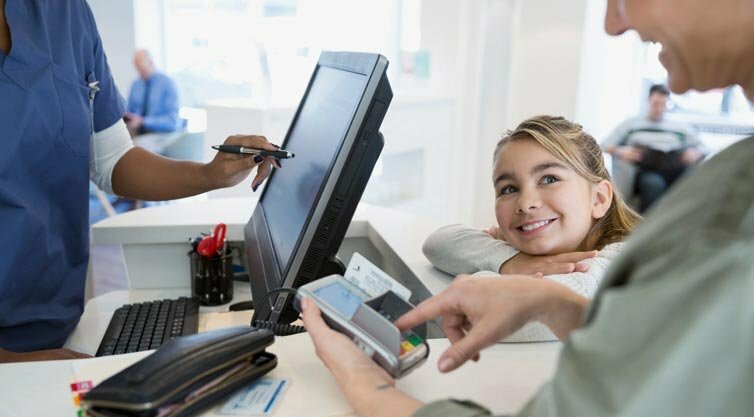 In addition, accepting payment cards can lead to greater patient satisfaction and loyalty, especially when a practice offers several options for processing payments. In the above-referenced BlackBook survey, 71 percent of patients revealed that mobile pay and billing alerts improved their actual satisfaction with their provider, and 95 percent of consumers polled advised that they would pay online if the provider’s website offered the option. Why isn’t everyone accepting credit cards? So what’s stopping the majority of health providers from offering electronic payment solutions? Accepting credit cards at your practice is easier than you think and practices can take payments online and via mobile, as well as at a traditional point-of-sale terminal at the front desk. If the practice prefers, they can work with software that is integrated into its existing electronic records management system. There are several easy things a health practice can do to keep your payment processing costs down. 1. Advise office staff to include all requested information. All data should be included (for example, a patient’s zip code) when running a transaction; even if a terminal or payment processing program permits staff to complete a transaction with incomplete information. A practice may see lower rates and fees if all requested information is entered. 2. Swipe instead of hand-keying a patient’s credit card information when the patient is present. Swiping or dipping a card is not only more secure, it helps reduce human error and potentially saves money on each transaction. 3. Batch out every night. Failure to batch out nightly can result in transactions being processed at a higher rate. 4. Become PCI Compliant. It’s an industry requirement, but it can also save money. 5. Understand what you’re paying and why you’re paying. If your health practice is already accepting credit cards, don’t hesitate to get a second opinion about processing rates and fees, as many payment processors offer a free statement analysis just for the asking. But beware of processors that offer rates that seem “too good to be true;” no doubt, that is often the case. To learn more about payment processing solutions for medical practices, contact TSYS online or call us at 1.888.845.9457. Or see our recent white paper, Understanding and Managing Credit Card Payment Costs: Trends for Healthcare Practices. 1 “Consumer Bill Payments Shifts & Strategies,” National Automated Clearing House Association (payments.nacha.org): 2017. On-Line Credit Card Services was incorporated in 1986 in Worcester, MA. We began as a home business and have grown substantially, while retaining a family-style, personal touch. © 2018 Online Credit Card Services, Inc. All rights reserved. On-Line Credit Card Services, Inc. is a registered ISO/MSP of Synovus Bank, Columbus, GA.